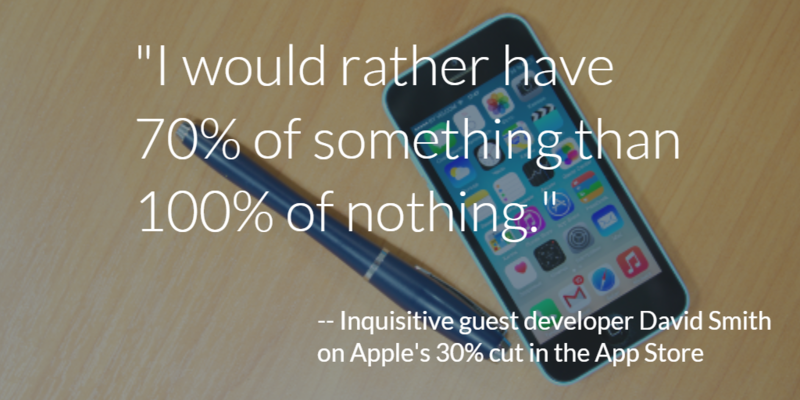 Our new favorite podcast, Inquisitive’s Behind the App, looks at the history of app prices as well as the cut Apple takes from developers who publish in the App Store. The quote is from this week’s episode. David Smith, a prominent independent iOS Developer—and one of our friends who is based just down the road from us—says the opportunity to reach customers through the App Store is well worth the 30 percent price iOS developers pay for admission. Listen in at the 6:40 minute mark. Last week’s episode talked about how supply and demand has changed in the App Store since the marketplace’s inception in 2008. The overabundance of apps today forces developers to take a more active, strategic approach to marketing. App marketing is no longer a simple matter of successfully releasing an app and letting the App Store market for you. Start the podcast on this topic at 16:35 minutes. Adding to the conversation, we shared our own tips for a pre-launch mobile app marketing strategyto helpnavigate the increasinglydifficult marketing process. Want to dive deeper into this issue? Check out App Marketing Weekly’s Ultimate List and subscribe to our blog, as we’ve plenty more marketing and development guides in the works. Learn more about PicIt! with this initial review on Apple World Today, a new site by the former editors/writers of TUAW. Check out Pic It! in the Apple Store and follow it on Facebook and Twitter. The 5 pillars of interaction design: This article tackles the pillars of IxD and UX as well as a steps to better interaction design. Not just helpful for apps! App store revenue, and selling to the world: A breakdown of Apple and Google payments to developers, as well as consumer spending, live devices, average consumer makeup, and how they all fit together in a glimpse at the iOS vs. Android horse race. The death of the login: Check out these alternatives to the maligned login wall. Avoid dropped users by relying on user history and settings within the app context as well as targeted notifications. But what about security and cross-platform services? Facebook’s Origami Live lets developers test app designs on their phones in real time: Designers take note. Facebook is releasing Origami Live through the App Store. It's the same tool used in a bunch of notable FB apps. Origami Live "lets you piece together hundreds of tiny graphical widgets and animations into something that looks—and behaves—a lot like a real smartphone app." There's also some great tutorials. The “Shark Tank” effect on apps: It takes more than a major publicity push to ensure the lasting business success of an app. Tech Crunch examines the fates of apps featured on Shark Tank. Case studies included. 21 questions to answer before you start that mobile app: A succinct list of questions to ask yourself before getting serious about that app project. So you want to build the next great mobile app? : Product purpose trumps polish and design according to Fueled's founder Rameet Chawla. Check out his thoughts on building great mobile apps in this vid. This week's swanky photo courtesy of (freeepy.com).